Nuclear SW – delivering £50 Billion of nuclear opportunities to the South West business community and workforce over the next decade. 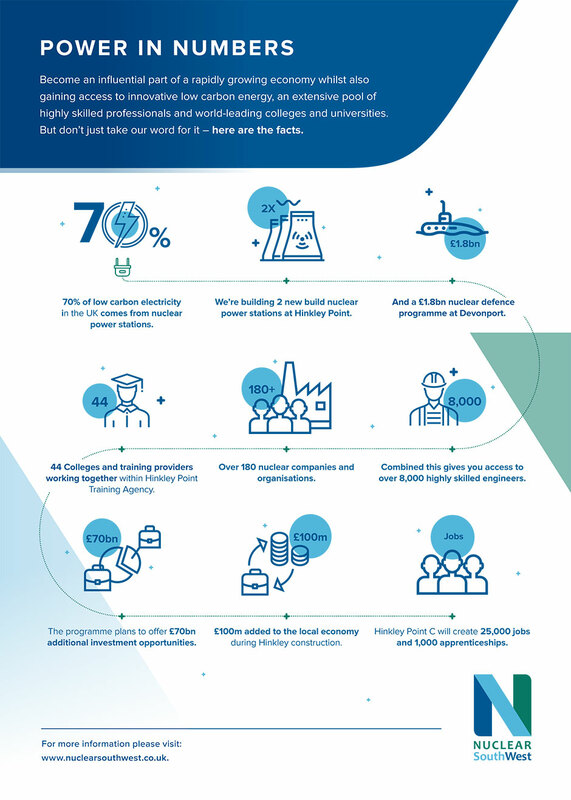 HotSW LEP is working hard to ensure that the catalyst of the first new nuclear build project in the UK for a generation at Hinkley Point C in Somerset, provides a lasting sustainable economic legacy for the HotSW area and beyond. The current construction at Hinkley is estimated to cost £20billion, with a significant proportion of that investment potentially being spent within the UK and the South West. The LEP is not funding any of this cost, and the area is set to benefit from the employment, skills and supply chain opportunities that Europe’s largest project will bring. A further SW new nuclear build is planned for at Oldbury in South Gloucestershire. There’s a £1.8bn nuclear defence programme at Devonport in Plymouth; The LEP has collaborated with the West of England Combined Authority and the Welsh Government to fund a three year Hinkley Supply Chain Support Service. The partnership includes HotSW LEP, West of England LEP, Dorset LEP and Gloucester First LEP. Nuclear SW is charged to develop a programme of activity to ensure that business and the workforce have the capability and skills that are required at the right time. Across the South West economic landscape we recognise the significance of the nuclear sector and its supply chain. We are committed to working collaboratively across the South West to ensure we maximise the benefit to UK plc from predicted growth in the nuclear sector. We have shared ideas, concepts, and proposals that support individual plans developed in our strategic economic plans and to ensuring that they are delivered collaboratively across the region. We see significant benefit and potential for our part of the world to be at the very forefront of developments in this important global sector. The evidence for this was highlighted in a report we commissioned earlier this year, the link to which is below. This was also reinforced by the conclusions of the South West and Wales Science and Innovation Audit that highlighted our world class nuclear industrial expertise. Nuclear SW will market these activities coherently and continue to shape an environment that encourages greater inward investment from key companies; and further develops the localupply chain while making sure that the innovation, research and development needs can be delivered locally; as well as providing a skilled workforce. Supporting the implementation of the UK Governments Nuclear Sector Deal Matt Burley, Director with PwC – Chair of Nuclear South West. More details can be found in the annual report included with relevant documents below. Heart of the South West LEP investing in the Hinkley Point Training Agency, an innovative approach to delivering the skills requirement to ensure that local people gain jobs on the project. Three LEP collaboration together with a number of Local Authorities to ensure that inward investment opportunities are maximised. High profile presence at the 2018 Department for International Trade Civil Nuclear Showcase. We will post regular updates here –also visit http://www.nuclearsw.co.uk/ for news of upcoming events, and for more detail about specific projects. In 2016 the Nuclear South West partnership held an event at Westminster – Nuclear South West – Powering the UK’s Nuclear Future – to showcase the strength in this sector Read about the event here and see the video which gives a snapshot of Nuclear South West.